If you are having trouble viewing this email, please click the following link. 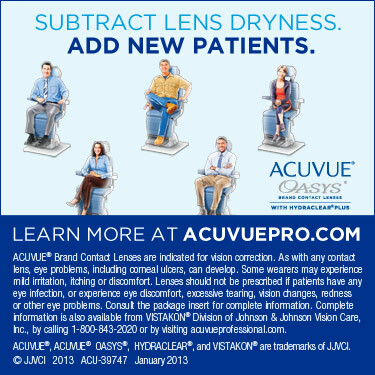 Alcon Launches Dailies Total1 Water Gradient Contact Lenses in U.S.
Are you measuring tear osmolarity in clinical practice? I recently had a contact lens practitioner from Nepal write to me about his beliefs regarding factors that impact complications of contact lens wear. At the top of his list was internet purchase of contact lenses. His email reminded me that the issue of internet purchase of contact lenses is one practiced by our patients in all corners of the world. While many contact lens practitioners hold beliefs about this practice, more scientific data would be helpful to show the potential risks (vs. benefits) associated with the internet sales of contact lenses. Alcon announced the U.S. launch of Dailies Total1 water gradient contact lenses at the 116th Annual AOA Congress & 43rd Annual AOSA Conference: Optometry's Meeting. The U.S. launch marks the culmination of more than a decade of product development and follows the successful European rollout of Dailies Total1 water gradient contact lenses. The highly lubricious lens surface results in reduced friction and minimizes interaction with the delicate tissues of the eye. With a Dk/t of 156 at the center of a -3.00D lens, Dailies Total1 water gradient contact lenses are also exceptionally breathable*, so more oxygen is allowed through the lens. Dailies Total1 water gradient contact lenses have a diameter of 14.1mm, an 8.5mm base curve and a center thickness of 0.09mm at -3.00D. They are made from a material called delefilcon A, which has a modulus of 0.7MPa. The lenses are currently available with a power range of -0.50D to -6.00D (in 0.25 steps); and -6.50D to -10.00D (in 0.50 steps). The lenses are packaged in trial packs of five and retail packs of 30 and 90. **In vitro measurement of unworn lenses; Alcon data on file, 2011. 1. Thekveli S, Qiu Y, Kapoor Y, Kumi A, Liang W, Pruitt J. Structure-property relationship of delefilcon A lenses. Cont Lens Anterior Eye. 2012;35(suppl 1):e14. 2. Alcon data on file, 2011. 6. In a randomized, subject-masked clinical study; Alcon data on file, 2011. CooperVision Inc. is launching additional parameters for its Avaira toric contact lenses worldwide. Beginning this month, the company will expand Avaira toric lens parameters with new +0.25D to +6.00D sphere powers to correct for hyperopia. A 2011 study indicated that 15.7 percent of hyperopes were also astigmatic.1 These new options join the existing parameter range, including sphere powers of plano to -6.00D in 0.25 steps; -6.50D to -10.00D in 0.50 steps; cylinder powers of -0.75, -1.25, and -1.75; and axes from 10 degrees to 180 degrees in 10 degree steps. The newly expanded Avaira toric lens range now covers more than 90 percent of astigmats, according to the company. 1. Young G, Sulley A, Hunt C. Prevalence of Astigmatism in Relation to Soft Contact Lens Fitting. Eye & Contact Lens. 2011;37: 20-25. Plan now to attend the Optometric Management Symposium on Contemporary Eye Care, December 6-8, 2013 at Disney's Contemporary Resort in Lake Buena Vista, Florida. This popular annual symposium provides the perfect balance of timely, disease management courses and practice-building courses with plentiful networking and leisure time to enjoy all that Disney resorts and theme parks have to offer. The educational program is presented by the Pennsylvania College of Optometry, Salus University. For agenda, more information and to register visit http://www.springervisionevents.com/event.aspx?eid=3. The American Optometric Association (AOA) launched a new website to better serve its members and the profession. The new site features responsive design, an enhanced Doctor Locator, and single sign-on for many AOA features. The new site keeps the same URL, www.aoa.org. According to AOA Executive Director, Barry Barresi, OD, PhD, the launch is the first phase of a series of upgrades and enhancements that give members the online access they need to resources essential for professional development and current best practices in practice management. Also, it was a priority to incorporate responsive design, which automatically formats content for any device including desktop, tablet, or smart phone. Even more convenience has been added by providing single sign-on for several popular services including EyeLearn online continuing education resources, Optometry's Career Center, and AOAExcel. In the coming months, sections of the site will continue to be developed. Ongoing enhancements for the AOA's online store, branded as AOAMarketplace, will include an expanded product selection and an improved customer experience. The area of the site dedicated to providing the public and patients with information about common eye conditions will be updated in the future as well. Optometry Giving Sight is urging all members of the optical community and anyone who values good vision to take part in the World Sight Day Challenge, from September 1st through to World Sight Day, October 10th. The World Sight Day Challenge is the largest annual global fundraising campaign to address avoidable blindness caused by uncorrected refractive error. In 2013, Optometry Giving Sight is launching a fresh look and feel to the campaign! Based on a concept of 'people power,' the colorful new logo and materials encourage fundraisers to come together to help the millions in need. Participating is easy - simply make a monthly or annual donation on or before World Sight Day, October 10. Optometry practices and optical companies can also be creative and engage patients, customers and staff with fundraising events throughout the Challenge period. This year Optometry Giving Sight will feature its new "people power" wristbands as an easy way for patients, employees and students to make a donation and participate in fundraising activities. To make or pledge your donation, or register your intention to fundraise, visit www.givingsight.org or call 1888 OGS GIVE. ABB Optical Group announced the recent hiring of Michael Dari as Vice President of Sales. Within his role, Dari will lead the recently combined sales teams of ABB Concise and Optical Distributor Group (ODG). Dari's proven background, including sales management and business development, as well as his overall senior level of industry knowledge compliments the vision and mission of ABB Optical Group. Dari comes to the company with 18 years of experience at Johnson & Johnson, 15 years of which were spent within the Vistakon division as a Strategic Account Director. Most recently, he held the position of National Account Business Director at Ortho Clinical Diagnostics (OCD) – a Johnson & Johnson company. During his time with Johnson & Johnson, Dari gained a deep understanding of the roles that the manufacturer, distributor, strategic and national accounts, buying groups and eye care practitioners all play within this industry. Fungal contamination two weeks post corneal collagen crosslinking (CXL) procedure resulted in diffuse central corneal scaring. GP corrected visual acuity was limited to 20/60 level. We thank Boris Severinsky for sending this image and welcome photo submissions from our readers. It is easy to submit a photo for consideration for publishing in Contact Lenses Today. Simply visit http://www.cltoday.com/upload/upload.aspx to upload your image. Please include an explanation of the photo and your full name, degree or title and city/state/country. We don't see too many aphakes these days, but once in a while, one shows up. I was recently referred a 12-year old aphake (due to congenital cataracts) who also has microphthalmia and nystagmus. His refractive error was around +20 D with -2.00 D of astigmatism. He wanted to wear contact lenses for both optical and cosmetic enhancements. I decided on a GP lens to correct his astigmatism and maximize optical clarity. Because of the high plus power and large center thickness, the lens will tend to drop inferiorly. Lens diameter and base curve combinations can be selected to optimize the fit. A large diameter with flat base curve should be used when trying to lid attach the lens, and this also has the benefit of a larger optic zone if the lens tends to decenter. Conversely, a small diameter with steep base curve can be used when trying to center the lens in an interpalpebral fit. To improve lid attachment, flatten the anterior lenticular curve (flange) and/or decrease the anterior optic zone (cap). Finally, control edge lift by specifying appropriate peripheral curves to optimize lens position and movement. Though this case was challenging, my patient has adapted quite well to his new GP lenses. Professor Harminder Dua and colleagues at the University of Nottingham in the UK have just published an article that may redefine corneal anatomy. They have characterized what they believe is a novel pre-Descemet's layer in the human cornea. From 31 human donor sclerocorneal discs from donors with a mean age of 77.7 years (median 82 years), they demonstrated a novel pre-Descemet's layer (termed Dua's layer) in the human cornea. By injecting air into the stroma of donor whole globes and sclerocorneal discs as in the clinical deep anterior lamellar keratoplasty (DALK) procedure with the big bubble (BB) technique, they were able to show that they could 1) still create and maintain a BB following peeling of Descemet's membrane; (2) peel off Descemet's membrane and still create a BB; and (3) create a BB and continue inflation until the bubble popped to measure the popping pressure. These techniques lead them to an acellular and strong layer, measuring 10.15±3.6 microns thick composed of 5 to 8 lamellae of predominantly type-1 collagen bundles arranged in transverse, longitudinal, and oblique directions. If this finding is confirmed by other laboratories in much younger eyes, it will be very important in lamellar transplantation procedures. For example, during DALK, surgeons may not want to bear all the way to Descemet's; rather, they may prefer to detect and bear down to this new proposed layer which will potentially retain greater strength in the transplant post-operatively. This article reports an unusual case with a bandage silicone hydrogel lens that was applied over cyanoacrylate glue application for corneal perforation. A 67-year-old woman with a history of corneal trauma experienced spontaneous corneal perforation in her left eye. Upon arrival, her anterior chamber was flat and Seidel test was positive. After initial treatment with cyanoacrylate adhesive and a bandage silicone hydrogel contact lens, there was no leakage and the anterior chamber was formed at the follow-up period. She was started topical antibiotics. After 7 years, she came back with the complaint of permanent redness in her left eye with the same silicone hydrogel lens in her eye. The authors concluded that corneal healing may occur under cyanoacrylate adhesive glue with therapeutic contact lenses and with proper antibiotic application. Silicone hydrogel contact lenses exhibit good efficacy and safety when utilized as a continuous wear therapeutic lens with antibiotics. © 2013 PentaVision LLC. All Rights Reserved.